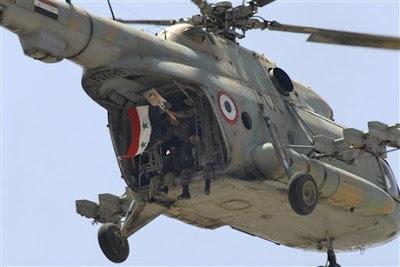 "friday-lunch-club": "A brief, more limited “mopping up” operation in Lebanon"
"A brief, more limited “mopping up” operation in Lebanon"
There are several obstacles to a significant Syrian intervention in Lebanon in 2012..... However, the Syrian regime may regard a brief, more limited “mopping up” operation in the border zone as a dual deterrent. This kind of operation could serve both to underscore to the Lebanese the potential costs of granting sanctuary to Syrian rebels, as well as to demonstrate the regime’s determination and capacity to act, thus discouraging other neighboring countries from allowing similar sanctuaries on their soil. A limited cross-border operation in northern Lebanon would act as a “dress rehearsal” for the wider armed conflict that may develop if the Syrian crisis degenerates into full civil war, or the Friends of Syria gear up for their own military intervention. The reactions of Syria’s other neighbors would be no less complex. Turkey would certainly protest a Syrian incursion into Lebanon; but it has repeatedly sent its own military into northern Iraq in pursuit of guerrillas from the Kurdish Worker’s Party (PKK), and may yet claim the right to act similarly against them in northern Syria, where their presence has increased. Iraq, which currently holds the rotating presidency of the Arab League’s council of foreign ministers, has its own problems with Sunni militants and is reported to have exchanged information with Syrian intelligence over the infiltration of jihadists from its territory into Syria. Jordan, whose king was the first Arab leader to call on Assad to step down last year, has tightened controls over the smuggling of arms destined for Syrian rebels across its border, and has seen its trade with Syria actually increase since the economic embargo was declared last November...."